We’ve made lots of variations on her simple, nutritious muffin recipes (sometimes with additions that make them a bit less healthy, but still vegan and without added fat). Since bars travel more easily than muffins, I just pour the batter into a rectangular baking pan and they always come out great. *you need 2 cups of liquid total, so adjust amounts as needed, depending on how much banana you use. Blend till liquified and pour over dry ingredients. Mix till combined , but don’t overdo it. 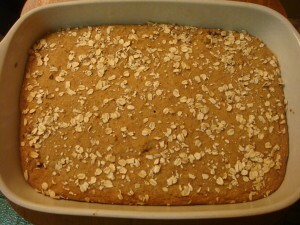 Fill 12 muffin tins or baking dish evenly and sprinkle the top with whole oats. Bake in preheated oven at 350 for about 30 minutes. and…. Go forth and be creative! 2 cups flour (whole wheat, oat or mix), 2 cups bran (or other cereal), 4 tsp baking powder and 2 cups liquid are the only requirements! Some other muffins we’ve made with the basic recipe include cranberry-orange, vegan chocolate chip, blueberry oat, cinnamon spice, and chocolate chocolate chip (sub 1/2 c cocoa powder for 1/2 c flour). Please let us know in the comments if you create a doozy we should know about!